Combine all ingredients in mixer at low speed until well-combined; about 2 minutes. Cover bowl and allow to rest for 20 minutes (autolyse). Then mix at medium speed for 5 to 6 minutes until smooth and silky. Turn out onto floured board and knead by hand for a few turns. Cut into four 7-ounce pieces. Next day, remove from refrigerator for about 2 hours prior to using. To make your pizza balls, shape each piece of dough into a ball. Gently roll your dough into a ball, then stretch the top of the ball down and around the rest of the ball, until the outer layer wraps around the other side. Pinch the two ends together to make a smooth ball with a tight outer "skin." Set your ball seam-side down where it can rest. Dust your pizza balls with flour, and store them under a damp towel, in a proofing tray, or under plastic wrap. This will prevent the outside of the ball from drying out and creating a crust, and becoming difficult to work with. The top of the pizza ball should be soft and silky. Once the dough is kneaded, place in lightly oiled bowl. Cover with plastic wrap and allow to rise at room temperature for about 3 hours. Turn out the dough onto lightly floured board. Using bench scraper, cut into 4 equal pieces. Gently round them, cover and allow to rise again for another hour. Then they're ready to use. In another Large pan place 2 T of butter and washed Portobello mushrooms cook on med-high until mushrooms are soft. Slice 2 large tomatoes in thin slices. Chop up a few Basil leaves. Sprinkle flour on a large cutting board and roll dough with a rolling pin until desired thickness and size. Spray a pizza pan with cooking oil and place pizza dough on pan. Take the juice and oil from the spinach and spread on the edges of dough with a pastry brush. Spread Ricotta cheese over dough. Place mushrooms, spinach and basil on top of cheeses and then arrange the tomato slices on top. Shake salt, pepper and garlic powder over pizza to taste. Sprinkle Mozzarella cheese over the pizza evenly. Cook at 450 for approximately 25-30 minutes. Times vary depending on the oven so start checking on the pizza after 15-20 minutes. This sounds lovely! Thank you for sharing this recipe with us. Yum, this looks delicious. 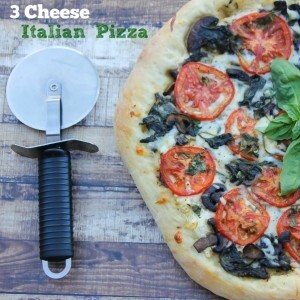 I have never made pizza before, I can;t wait to give this a try. Thank you for sharing this recipe. 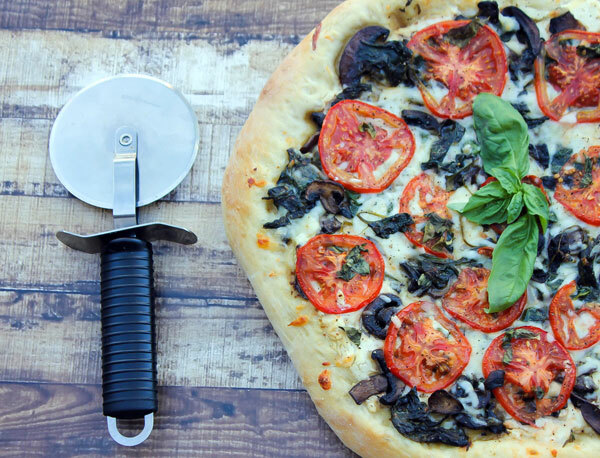 I love that this Pizza has veggies on it… I love those portobello mushrooms. Yummy! I don’t do a lot of mushrooms but I like portobello when we do eat them. We love homemade pizza but usually use a store-bought crust. Gonna have to try your make-from-scratch recipe. Thanks! We often use store bought as well, but it is nice to have this recipe on hand to make a full home made one once in a while.